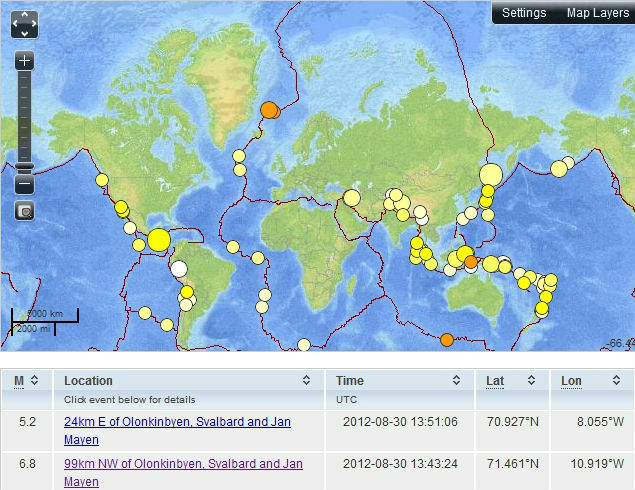 Two earthquakes struck the waters off the coast of Jan Mayen Island on August 30, 2012. One had a magnitude of 6.8 on the Richter Scale and occurred at 13:43 pm (UTC), and was followed eight minutes later by a second one with a magnitude of 5.2 on the Richter Scale that took place on 13:51 pm (UTC). The location of the earthquakes is indicated by the blue square on the top left of the USGS map below. 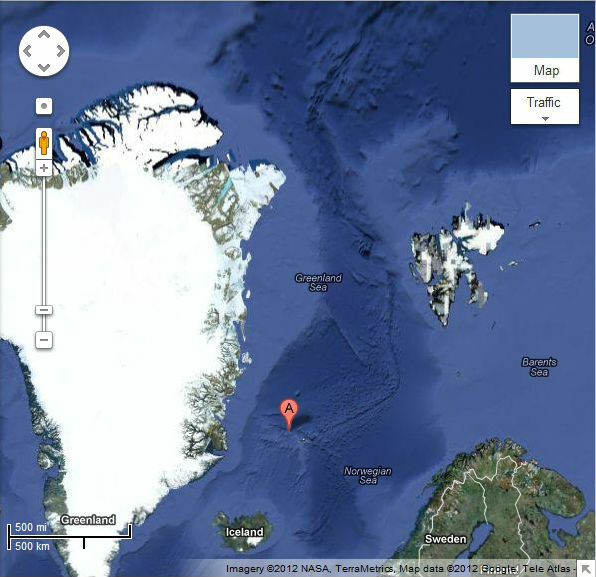 The Google map below shows that the location is on fault line extending north into the Arctic Ocean. The map below shows the two earthquakes at the top in orange. 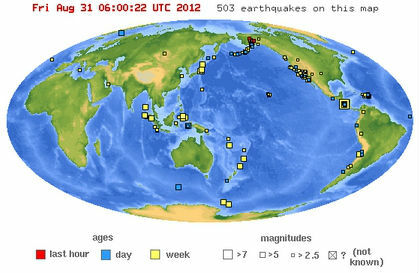 The map shows all earthquakes with a magnitude 5.0 or higher that happened worldwide from August 1 to 30, 2012. The largest earthquake in August 2012 was a magnitude 7.7 quake on August 14 in the Sea of Okhotsk, close to Sakhalin, Russia's largest island. With a depth of 626 km (389 miles), it was a "deep-focus" earthquake. Such quakes can be felt at great distance from their epicenters. As the above map shows, this 7.7 M earthquake and the two recent ones off the coast of Jan Mayen Island occurred on the same fault line that goes over the Arctic. The danger is that further earthquakes on this fault line could destabilize methane hydrates in the Arctic, triggering release of huge amounts of methane. The map below, from this page, shows fault lines and elevation in meters. sliding some significant amount (1-2%) of the Greenland ice sheet out to the Ocean, thus cooling the Arctic and gaining back the Arctic sea ice? Could it be in fact the geoengineering strategy to reverse the climate changes? Any seismic activity terrifies me, because there's so much free gas in the sediments in the Arctic under shallow seas. Reversing climate change will take a large number of methods to be applied and perfected over the course of many years. Some of them, such as soil supplements containing biochar and olivine sand will probably have to be applied for the rest of the century to get us back to safer conditions. It likely takes more heat to melt water ice molecules surrounding methane in form of hydrate than pressure from methane expansion of 170 to 1 as melt occurs in closed surrounds of hydrates would produce. Otherwise it could destabilize precipitously in explosive way. But sediment containing free gas shaken sure could release in a hurry. Particularly as permafrost melts from temp rise. There are if I'm not mistaken incidence of more small earthquakes due to Earth heat up and expansion of crust right now particularly in Arctic. The event that will trigger sudden release of methane from continental shelf of Arctic is a definite consideration for visitors there..
As Greenland's ice cover melts and flows into the sea, a substantial weight disappears, changing the pressures acting on the Earth's crust along a major fault line that extends into the Arctic. This can contribute to submarine earthquakes and volcanic eruptions in the Arctic. In sediments affected by seismic activity, the risk increases of free gas release, while hydrates contained in sediments could also be destabilized and start releasing methane. Shockwaves from earthquakes can travel quite a distance through sediments, especially "deep-focus" quakes which can hit the Gakkel Ridge, in turn causing landslides in areas such as the ESAS, which can destabilize hydrates and liberate methane from sediments in the ESAS; much of the methane will enter the atmosphere unaffected in such shallow waters.